I recently had the privilege of interviewing Vicki White from Chicago Books to Women in Prison, an excellent organization that (as the name suggests) provides reading and writing material to incarcerated women nationwide. After you read the interview, check out the links at the bottom to find out how you can contribute to this wonderful work. Fourth & Sycamore: Tell us what Chicago Books to Women in Prison (CBWP) is all about. What is your mission? Chicago Books to Women in Prison: We send paperback books free of charge to women in state prisons in nine states—including Ohio—and Federal prisons across the country. We offer women behind bars the opportunity for self-empowerment, education and entertainment that reading provides. We meet every Sunday afternoon. Volunteers open and read letters from women in prison, select three books that match each request, and write a personal note to include with each package of books or a blank journal. 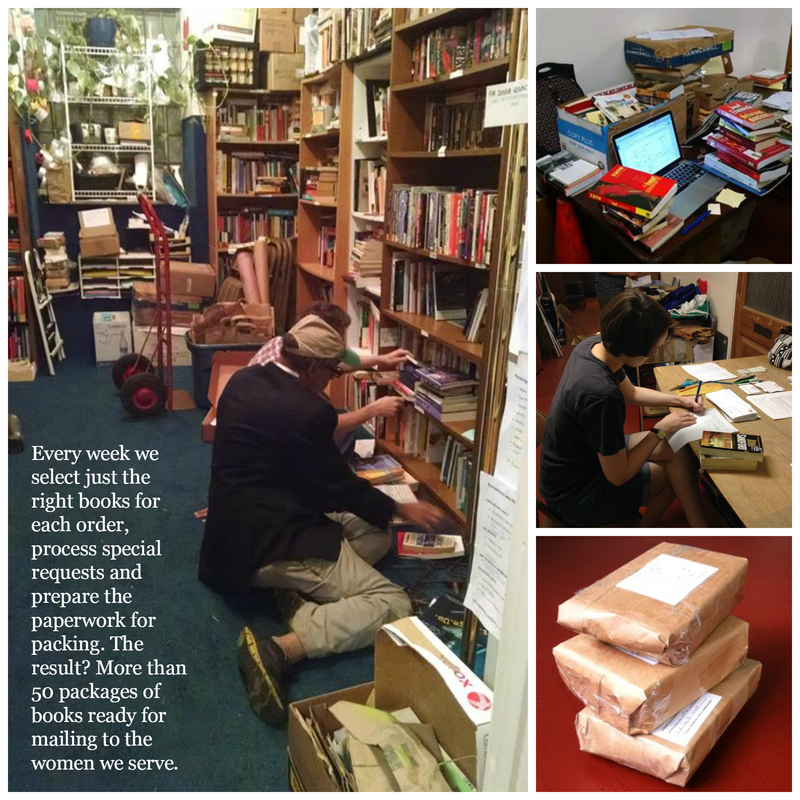 Other volunteers wrap books for mailing, shelve new donations and work on sourcing harder-to-find special requests. F&S: When was CBWP founded, and how did the idea come about? CBWP: The group was founded in 2003 by four women concerned about what’s been called “our prison nation” and who wanted to help prisoners directly and empower them. Soon after they found that the books they were sending to prison libraries weren’t being shelved because prison libraries tend to be understaffed, and they learned about the Women’s Prison Book Project in Minneapolis. Since then our two groups basically divide up the states to which we send books. We’re still the only prison book project dedicated to women. F&S: How do female inmates around the country get connected with CBWP? CBWP: Word of mouth seems to be the main way incarcerated women hear about us. We’ve been sending books to some prisons for so long that it’s not clear how we first made contact. More recently we’ve connected with librarians, lawyers and others who enter prisons and they take our order forms with them. Occasionally we receive email or Facebook requests from friends and family members to send books to their loved ones, and these are often prisons where we have little presence. We always include extra blank order forms to help spread the word. F&S: What are some of the challenges the organization has faced in doing its work? CBWP: Fundraising is one. For one thing, the attitude of many people is that prisoners do not deserve the kind of help and respect projects like ours give them. We’re a 100% volunteer organization, so every dollar goes directly toward our work, whether it’s our modest rent for two rooms in a church, minor expenses like website domain renewal or postage. The latter is by far our biggest expense—82% of our annual budget of about $11,000. Recently we received our 501(c)(3) determination from the IRS, and we’re confident this will increase our funding opportunities. In addition to sending books, we aim to bring the voices of the women behind the walls outside. One project we envision, perhaps in the coming year, is the relaunch of an anthology called Bound Struggles featuring the writing and art of incarcerated women. It’s been several years since CBWP was able to produce an edition, and we continually receive poems, drawings and other creative work that deserve to be published. F&S: What results have you seen so far? What kind of impact is CBWP having? CBWP: The strongest evidence of the value of our work is what we hear from the women we serve, as well as from supporters who work closely with incarcerated women. About two-thirds of women in prison are mothers of minor children, so we have little doubt that we’re helping improve the lives of their families and their communities as well. Thank you so much for the books you sent to me! I assure you they will be well loved and read by the time they have been shared around a whole dorm of 71 women. I am really getting into my reading lately because I am having a hard time here lately. I am hoping you have some journals or a composition book that I can journal in because the one from my counselor was stolen. I find that writing gives me a voice that I would not ordinarily have inside this institution. I have never been through anything even remotely like this before so I am having a hard time dealing with it all. Reading gives me a way to escape from the stress and utter chaos of life here. I am fortunate to be going home in 6 months and I can assure you that I will not be one of the ones to repeat this experience. Thank you so much for all you do for us. You are very much appreciated. Thank you very much for all you do. My friend received some grammar books from Chicago Books and she hasn’t put them down. You guys are making a difference. F&S: Can you share one of your favorite stories from working with CBWP? On the first of the year I began writing a “Gratitude Journal.” Every night the last thing I do is write an entry for something—no matter how big or small—that I’m grateful for. I’ve found it to be extremely therapeutic and enjoyable. It’s way too easy to focus on the negative that surrounds us, especially in a place like this, so I like to end every day on a more positive note. Whether I’m grateful for my supportive family and their unconditional love or for the Q-tip or the stars, it’s something that others may not have or be able to enjoy, and for that I’m grateful. One of my favorite stories from CBWP involves a letter I opened from a mother in prison. In the letter she told us a lot about herself, including the fact that she had two teenage daughters and a young son. In her book request she asked specifically for books on parenting, because she wanted to do a good job raising them once she was released. I was so excited that we had books about raising boys and girls that I could send her, because it’s so satisfying to feel you are helping someone improve her future. I decided to use my own money to purchase three books for a woman who had requested books about welding and underwater welding (a topic we would most likely never receive via donated books). I picked out three books online about welding that seemed like they would be helpful (but who was I to know? I was choosing somewhat blindly, not knowing anything about welding) and she wrote back and was very grateful for the books, and said that she had tried writing to three other organizations to get materials on welding and no one else had answered her request. It was rewarding knowing that she now had the books she wanted, and sobering to note the relative ease with which I was able to access and purchase these books at my choosing. F&S: How can our readers donate or otherwise help? CBWP: We invite the readers of Fourth & Sycamore to visit us at chicagobwp.org. We always appreciate financial contributions and book donations, and readers will find details on how they can help in those ways. Also follow us on Facebook and on Twitter @ChicagoBWP. Please join the conversation! F&S: Is there anything else you’d like to share with our readers? Thank you for the opportunity to tell the readers of Fourth & Sycamore about Chicago Books to Women in Prison! F&S: Thanks so much for talking with us. Chicago Books to Women in Prison is a wonderful organization doing important work. You can donate to CBWP via Paypal on their website, where you can also find a full list of other ways to help.